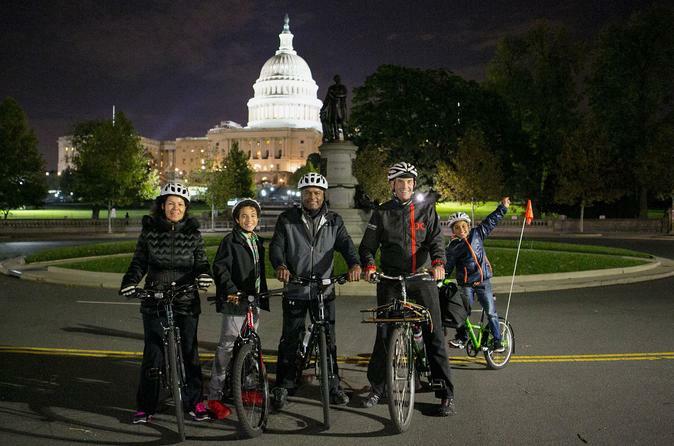 Bicycling among DC illuminated marble monuments is magical against the night sky. Ride stress free on the safest routes around Washington DC with your own knowledgeable private guide. With fewer tourists, light traffic, and no beating sun, take in the breathtaking sights and serenity while enjoying an easy ride around the city. You'll have a safe, fun, personalized experience with this private 2.5 to 3.5-hour tour. Be inspired by the illuminated monuments against the night sky of the nation's capital! Your private guide will meet you at your hotel or local accommodations to lead you on your own customized 2.5 - 3.5 hour bike tour. Bring your own bikes if you have them; if not, your guide can make arrangements for rental bikes to be delivered (additional rental rates apply). He will also bring the lights, snacks and water for you and your party. While navigating the safest routes and bike lanes, your private guide will carry any gear you have so that you can focus on enjoying the ride and sights. You'll receive a new premium water bottle to keep as a souvenir. Over the course of the tour, you can bike by the White House, Washington Monument, Jefferson Memorial, and Lincoln Memorial. Explore the MLK Memorial, Vietnam Veteran's Memorial, Korean War Memorial, World War II Memorial, and possibly more sights if you wish. With this private bike tour, you're guaranteed to enjoy a safe, fun, and memorable ride through the streets of DC!